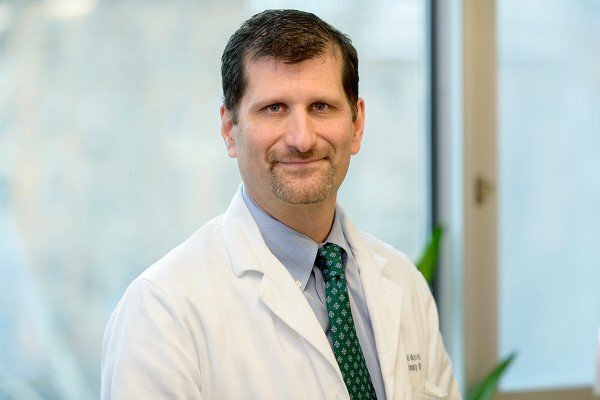 I am a board-certified medical oncologist who specializes in treating men with prostate cancer, particularly those who have metastatic disease (disease that has spread to distant organs) or who are at high risk of developing metastatic disease. I am the Prostate Cancer Section Head, which means I lead a group of experts who are dedicated to researching and treating this disease. Much of my research focuses on drugs that can deliver radioactive molecules targeted specifically to prostate cancer cells or to the distant areas where the cancer spreads. These drugs can be used alone or in combination with other anti-cancer strategies. This research represents a team effort between medical oncologists, nuclear medicine doctors, and radiologists to bring these novel and exciting drugs to the people with prostate cancer who need them. I am also interested in developing new ways to image prostate cancer using unique, prostate-cancer-specific PET scans and other new imaging methods. This type of imaging not only provides insight into where the prostate cancer is located but informs us about its biology as well. Treatments can then be more precisely and personally tailored to an individual’s disease. One of my priorities is increasing patient access to clinical trials. I am one of the leaders of the Prostate Cancer Clinical Trials Consortium. This initiative is designed to increase patient access to clinical trials across the country. I also chair the Genitourinary Committee of the National Cancer Institute’s cooperative group Alliance for Clinical Trials in Oncology, which facilitates testing new drugs nationwide. I have been very involved with the American Society of Clinical Oncology, taking various roles centering around prostate cancer and other genitourinary diseases.